Named for Colonel Benjamin Bellows, one of the original grantees of Rockingham. Vermont tends think of him as one of her own, but in fact he lived across the river in Walpole, New Hampshire. The colonel gained his rank in the British army, serving in several of the wars against the French in North America. His last military service was in the colonial cause at the battles of Hubbardton and Bennington. A skilled surveyor, Bellows surveyed most of the towns on both sides of the Connecticut River that were later granted by Benning Wentworth. 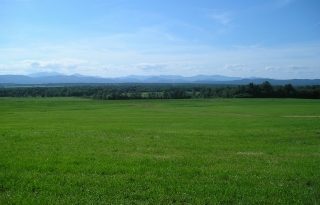 The Colonel is said to have held title to some 9,000 acres in Vermont and New Hampshire at the time of his death in 1777. The village has served as a river and overland crossroads for commerce and travel by foot, stagecoach, riverboat, train, truck and automobile. Its “golden eras” blossomed with the local application of new technologies, from canal to railroad to paper and farm machinery manufacturing. With wood, brick, iron, steel and stone, generations of residents have sheltered life and livelihood at a place of natural beauty and practical value. Today we can still read the story of those efforts and aspirations in a rich legacy of surviving residential, commercial and industrial buildings. 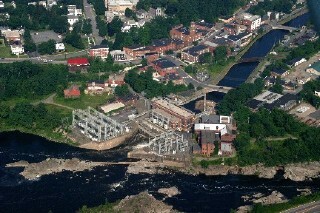 Although many village buildings are listed on the National Register of Historic Places, Bellows Falls is not a village captured in a museum. It continues to build on its past. America’s first canal was dug here, for example, and now is used to generate electricity. Many buildings still serve their original function. The naming of earlier architectural styles is a means to bring some order to the creative disorder of human invention. Many buildings, hybrids of several styles, offer historic clues about the ebb and flow of a community’s resources. For example, Greek Revival-style homes with later Queen Anne-style additions are evidence of the village’s boom periods. Human activity dates back several thousand years where the river Native Americans called Quon-eh-to-kot (“long river”) narrows at the base of Fall Mountain. Until European settlement, natives gathered at the falls to harvest shad and Atlantic salmon migrating upriver to spawning areas in the north. 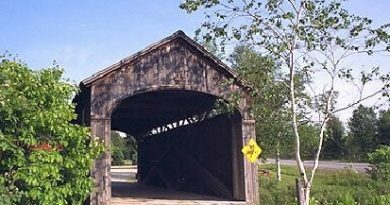 A covered bridge, the first across the river in Vermont and the first of many subsequent road and rail crossings at Bellows Falls, spanned the gorge in 1785. This rocky bend in the river made the town a hub for tourism, travel and transport and remains a natural wonder.